Rand McNally and Co.'s New Handy Map of Brooklyn and Vicinity. 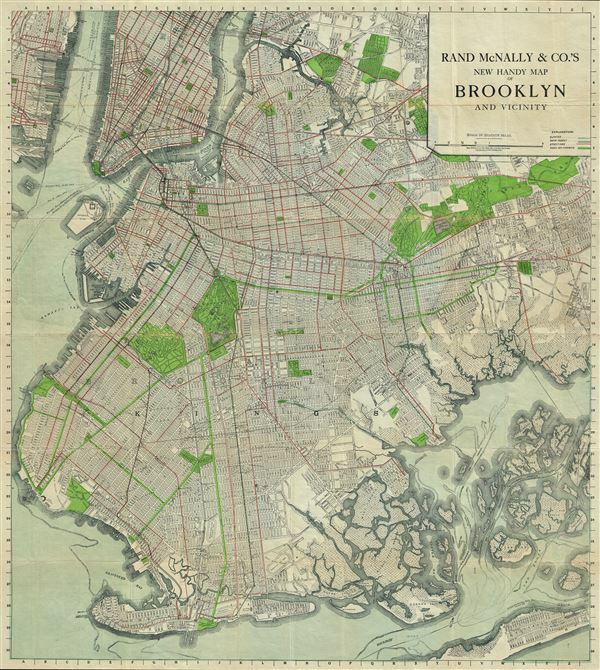 This is an excellent 1911 Rand McNally and Company map of Brooklyn, New York. It covers Brooklyn from Long Island City to the Rockaway Peninsula, including parts of Manhattan, Queens and Jersey City. This extremely detailed map identifies major and minor streets, individual buildings, parks, ferry lines, piers, cemeteries, street car lines, and several other topographical features. Prospect Park, Greenwood Cemetery, Governor's Island, City Hall, Navy yard, etc. are noted. The numerous marshy islands of Jamaica Bay are also included. This map was issued by Rand McNally and Company as the New Indexed Handy Map of Brooklyn and Vicinity in 1911. Very good. Some wear and toning along original fold lines. Professionally flattened and backed with archival tissue. Accompanied by original paper binder.